Tap the Android menu button. You can either type or paste in your Bitcoin wallet address into the field. If you do not immediately see the new Facet, either force close and restart the app, or log out and log back in. It will be available from that point onward. 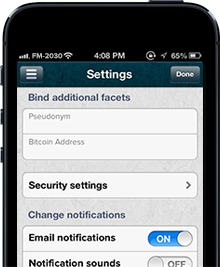 As with all Facets, Gliph sets public visibility to the Bitcoin Wallet Address to off by default. You can still make it public, or on a user-by-user basis share that information with someone else. Also, your Bitcoin wallet address is encrypted using the same AES-256 encryption on your other facets.